Definition at line 1241 of file LazyCallGraph.h. Inform generic clients of the result type. Definition at line 1248 of file LazyCallGraph.h. This just builds the set of entry points to the call graph. The rest is built lazily as it is walked. Definition at line 1254 of file LazyCallGraph.h. 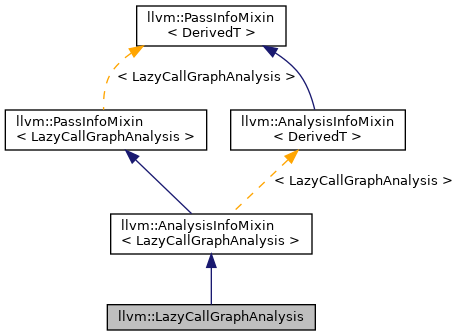 References llvm::AnalysisManager< IRUnitT, ExtraArgTs >::getResult(), and llvm::LazyCallGraph::LazyCallGraph().